Handling Evaluations and Tours are by appointment only. 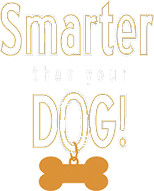 Tour times may be scheduled Monday – Friday 11:00 a.m. – 2:00 p.m.
Smarter than Your Dog! Daycare gives your dog a stimulating day with their canine friends, then they go home TIRED. Owners enjoy a dog-free, guilt-free day. We use a canine pack model, and the dogs are continuously supervised. This approach helps dogs learn appropriate pack behaviors. Services by appointment only are available Monday through Friday from 10:30 am to 5:30 pm.